Breakfast is considered the most important meal of the day, and your breakfast choice may help you lose weight and lower your cholesterol levels. 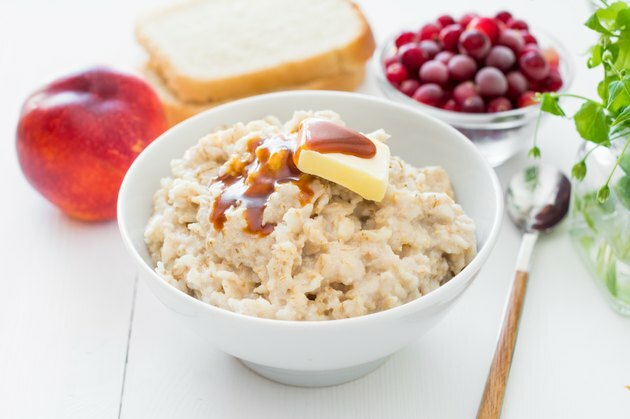 The Oatmeal Diet involves eating oatmeal three times a day in order to curb appetite, drop excess pounds and lower your total and low-density lipoprotein cholesterol levels. Consult your doctor before making any changes in your diet plan. There are several versions of the Oatmeal Diet and there is no specific diet plan to follow in order to reap the benefits of eating oatmeal, according to EveryDiet in the article "Oatmeal Diet." A high-fiber diet based on eating oatmeal several times a day incorporates healthy whole grains into your eating plan, which may help you lose weight, especially if you're substituting oatmeal for refined carbohydrates or foods that are high in saturated fat. According to the ABC News website in the article "Forget Diet Pills, Try Oatmeal," eating oatmeal may be effective as a weight-loss tool because it is rich in soluble fiber. Soluble fiber expands and sits in the intestines for longer periods of time, which may attribute to a feeling of fullness for more time after eating. Soluble fiber also slows down the rate of speed that nutrients flow through your bloodstream, which may help you feel satiated. EveryDiet suggests eating 1/2 cup of oatmeal for breakfast, lunch and dinner. For breakfast, add 1/2 cup skim milk, 1/2 tsp. cinnamon and 1 tbsp. raisins to the oatmeal. For lunch, eat 1/2 cup of lowfat yogurt and a banana in addition to the oatmeal. For dinner, eat a salad and 4 oz. of grilled chicken breast. Supplement the meals with snacks throughout the day, like blueberries or raw vegetables. The Oatmeal Diet encourages eating between 900 and 1200 calories per day, notes EveryDiet. This is lower than the recommended average daily calorie intake for an adult, which is 2,000 calories per day. Spice up your meal plan and eat a variety of healthy foods every day like fish, spinach, apples, grapes, oranges, carrots, red peppers and celery. According to MayoClinic.com, eating 10g or more of soluble fiber every day may lower your low-density lipoprotein, or bad cholesterol, and total cholesterol. One and 1/2 cups of oatmeal per day, the total amount recommended for the Oatmeal Diet, contains 6g of soluble fiber. In order to lower your cholesterol, eat at least 4g of additional soluble fiber throughout the day. Fruit, vegetables and whole grains contain soluble fiber that will help you reach 10g of soluble fiber per day.